The iPhone will hit Tesco stores nationwide on Monday, 14 December, the supermarket giant has revealed. You can bag yourself a free 8GB iPhone 3G or 16GB iPhone 3GS when you sign a two-year unlimited calls and text contract with Tesco. But be warned: the contract costs a whopping £60 ($97/€66) per month. 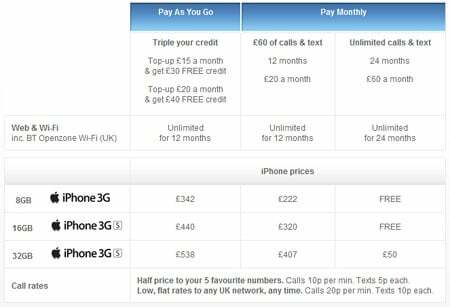 Tesco’s cheaper tariff only costs £20 ($32/€22) a month, but means you will have to pay something towards the phone: £222 ($361/€245) for the 3G model or £407 ($662/€450) for the 32GB 3GS. Pay-as-you-go iPhone options are also available on Tesco’s iPhone aisle. The payment plan still gives you unlimited web access for 12 months, though will see your wallet lightened to the tune of £538 ($875/€594) for the 32GB iPhone 3GS. If you’re a Tesco regular then don’t forget to hand your Clubcard over when you buy the iPhone, because Tesco is offering double Clubcard points on the handset and triple points for every £1 you spend on top-up vouchers or your monthly bill.